Showcases a Variety of Products! 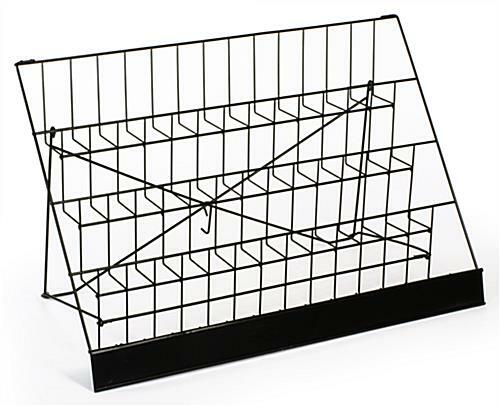 This wire countertop rack holds a variety of retail merchandise. 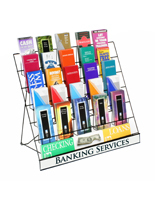 Table top, counter display is one of the most effective merchandising methods. This tabletop stand is built with light weight but strong wire making it durable and versatile. 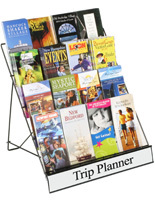 This counter display has 4 open rows with 2½" deep pockets. It is suitable for books, CD's, videos, cards and magazines. 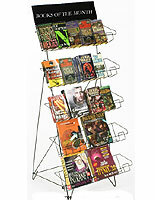 This countertop wire rack, also known as a metal literature stand, is one of the best selling retail tools. Counter stands are also portable and space saving. 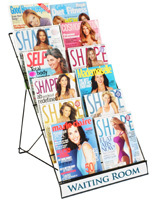 Product stand can be used in supermarkets, bookstores and many other settings. 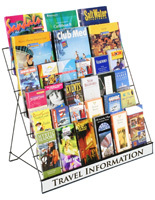 At the bottom of the wire rack stand is a black sign channel plate for 29"w x 2-1/2"h printed messages. 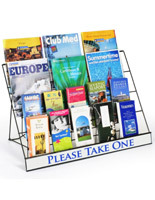 We do not include a printed message for the sign channel, the "Please Take One" inserted sign is pictured only as an example of what your custom sign might read. 29.0" x 17.5" x 14.5"
25.0" x 5.5" x 2.5"
I’m prepping for a craft show and wanted something that could display my prints. This exceeded my expectations! I’ll be able to display almost all of my print designs. I highly recommend this product. Your prints look amazing, Kassandra! Thank you so much for sharing this picture of your wire rack in action and for the awesome review! 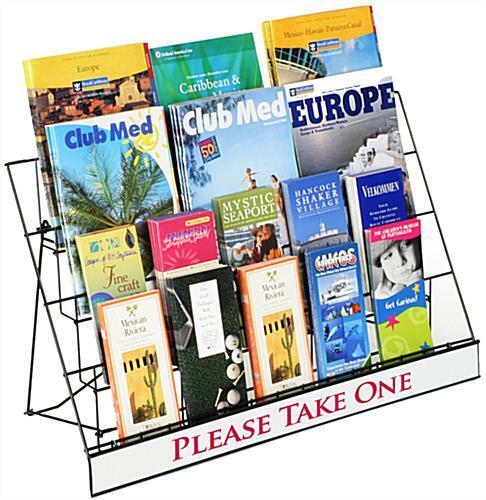 The 4 tiered wire tabletop display rack is great for our front entrance table to display brochure and books on our are and surrounding areas. Its a great way to advertise local events and area attractions. 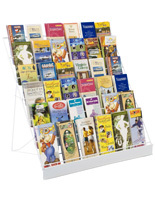 The display rack is sturdy and has a great amount of room on it. I am very pleased with my purchase and have had many positive comments from patrons that visit our museum. Thank you for the great review, Terrisa! We would love to see this in use if you want to share any images with your review. Thank you for taking the time to share with us and we hope we have the chance to work with you again soon. Liked these so much, I bought more! I originally bought two 4-tiered wire display racks, and was so happy with them, I bought two more. Sturdy and well priced! We're so glad you're a fan of these, Stacy! Thanks so much for shopping with us. 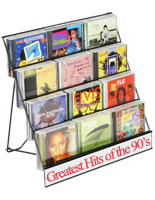 This rack works just fine for holding CD's and Song Books for sale at concerts. It is easy to transport and set up, and looks professional. This table cloth was well made. For my table perfectly and created a professional look for my sales booth. Posted one year ago by Melissa R.